This post was prompted by a webinar I gave on behalf of Citrix/GoToWebinar on 6th July 2011 and originally posted as a guest post on the Learning Pool blog. I’ve made a few changes to it here. eLearning has been with us in one form or another for at least the past 50 years, maybe longer. Probably the first player on the enterprise eLearning block was the University of Illinois’ PLATO learning management system, built in 1960 to deliver training through user terminals (which, even then, had touch-screens). Some would argue that quite a few of today’s LMS offerings haven’t advanced a great deal from PLATO. They serve up content and track activity. My own exposure to eLearning began back in 1964 when learning speed reading via an electronic system at my secondary school. The speed reading machine was about the size of a large refrigerator and probably weighed roughly the same (maybe they even shared components). However despite the obvious limitations, technology was making its way into learning through a number of routes even back then. My first involvement in working with learning technologies that we’d recognise today was when tutoring at the University of Sydney in the early 1970s. In the School of Biological Sciences lectures were pre-recorded and delivered across the campus on TV screens and the labs were supported with tape-driven experiential learning activities. Content was still analogue, but delivered in ‘e’ format. My exposure to eLearning in the early 1980s really got me ‘hooked’ on the potential of technology in learning. At the time I was running online collaborative learning courses. The ‘hooking’ was reinforced later in the 1980s when I was reviewing Interactive Video training programmes for the UK National Interactive Video Centre). I saw some great ‘interactive’ and engaging learning activities in those big 12” disks – the content was used to support experiential learning. At the same time I had the pleasure of sitting on the national steering committee of the TTNS service in the UK – an innovative collaboration between British Telecom and (I hardly bear mention in the current UK ‘hacking scandal’ climate) Rupert Murdoch’s News International. TTNS supported technology-based learning for schools and Further/Higher education in the UK. Every schoolchild in the UK had an email box on the Telecom Gold service – a very innovative step at the time. The point of looking back is that it helps understand the fact that various forms of technology-based learning have been around for a long time, and that some of the pedagogies that were used in early days were equal, or superior, to the predominantly ‘course vending machine’ approaches that emerged in the late 1990s on the back of generic course catalogues and with content-led eLearning generally. Some of these 1990s models, to a greater or lesser extent, are still with us. I think it’s a good time now to both look back and look forward and to re-think our approach to eLearning generally. “The good news is plentiful. eLearning enables us to deliver both learning and information at will, dynamically and immediately. It allows us to tap the knowledge of experts and non-experts and catapult those messages beyond classroom walls and into the workplace. And …it lets us know, through the magic of technology, who is learning, referring, and contributing—and who isn’t. …Then there’s the bad news. Many simply fail to embrace eLearning. Like the sophomore taking a course called “Introduction to Western Civilization” via distance learning falling behind on assignments or the customer service representative who looks at two of the six eLearning modules and completes only one, or the supervisor, who had the best intentions, but is too busy with work to be anybody’s e-coach”. Allison goes on to point out that “Every industry study reveals marked increases in training and development delivered via eLearning, often with disappointing numbers characterising participation and persistence….participants in eLearning programs are less likely to follow through than in an instructor-led program”. This should give us cause to pause and think - and re-think - about our approach to eLearning . Not so much about eLearning as an approach in general - there’s plenty of evidence that it can be an effective way to assist and speed development - but we need to think about HOW we are employing and deploying eLearning. There’s clearly room for improvement there. This also raises another fundamental question for me. Where do current ideas about eLearning fit into the ‘new world’ of work and in the new world of building workforce capability in the 21st century? A great deal has changed since the term eLearning first entered the vocabulary in 1999 and since web-based courses and modules started appearing in volume in the early 2000s. We need to rethink eLearning in light of these changes and other changes that are only now starting to impact the world of work. A major driver for us to re-think eLearning approaches is the move away from the 20th Century ‘push’ models of learning - with modules, courses, content and curricula being pushed at employees. We’re seeing a move towards a 21st Century ‘pull’ model - where workers ‘pull’ the learning and performance resources they need when they need to improve their work performance. They may need a course, but are more likely just to need some ‘here-and-now’ support to solve a problem or overcome an obstacle and then move on. 1. A move away from content-centric mind-sets. 2. A move away from ‘course’ mind-sets. I’m sure most of us are aware that the major challenge for learning is no longer about ‘content’ or ‘knowledge’ (if it ever were). We can find content whenever we need it. Our lives are inundated with content. We may not have great filters for content – that’s the real challenge - but there is no doubt they will arrive in the next few years. The need now is for other skills such as critical thinking and analysis skills, creative thinking and design skills, networking and collaboration skills, and, across all of these, effective ‘find’ skills. The development of these new skills has nothing to do with content or ‘knowledge transfer’. It requires new mind-sets and capabilities that I’ve come to call ‘MindFind’ – mind-sets and capabilities that support us in finding the right content when we need it, at the point of need. Obviously the need for content won’t go away completely, but we know that content is of greatest use when we can access it in the context of a specific challenge, not when we’re provided it in a class or an eLearning course and try to remember it until we take the end-of-course test - context is (almost) all. We need an understanding of core concepts, certainly, but Learning professionals shouldn’t be wasting their time serving up all the details about ‘task’ in closed eLearning packages. They serves little purpose and the vast majority is forgotten immediately after the course or working through the eLearning modules. The challenge for Learning professionals is all about helping workers make sense of what is expected of them, how they can gain the right experiences, how they can get opportunities to practice, how they can find the right people to help, and how they can have time to reflect on what they’ve done and what they’ve learned so they do it better next time. This is not achieved by creating and delivering learning ‘content’. It’s achieved by utilising the right context. So we need to replace content with context – learning through doing, rather than learning through knowing. We also need to move our focus from ‘know-what’ learning to ‘know-how’ learning. From content-rich to experience-rich. And from ‘know-what’ learning to ‘know-who’ learning as well – we are who we know, and our expertise is the sum of our own resources and others we can draw on when needed. The latter is why social learning is such an important element in learning and needs more focus. It is not just ‘social’ for the sake of being social. Workers will want to co-create. Lots of the learning content of the future will be generated by people who are doing the work rather than by specialist training instructors and learning specialists. Learning professionals need to think about how they can facilitate and support this, rather than creating the next greatest content-heavy eLearning package. Instead they need to think about helping workers make connections and building communities where they can mine their own learning. Workers will also expect their learning to be more personalised and available in a self-service mode so they can get what they want when they want it and where they happen to be. That means Learning professionals need to consider new channels for learning. Last month I was working at the Umm Al-Qura University in Mecca, Saudi Arabia with my Internet Time Alliance colleague Clark Quinn, and had the opportunity to ask the Dean of IT about the penetration of smartphones, notebooks and tablets among the 60,000 student population at the university. He estimated 90% had smartphones and at least 50% currently had tablets or notebooks. I am sure that penetration is even higher in many other parts of the world, and not just in the ‘developed’ world, either. A big part of the future of learning, as with our daily lives, is surely going to be mobile. We need to make sure that any content that really needs be made available to help with learning is accessible on multiple platforms. More to the point, Learning professionals need to be thinking about creating learning EXPERIENCES rather than learning content. As such, we need to move away from content-rich, experience-poor learning towards a focus on helping workers have rich learning experiences from which they can develop. Many Learning professionals default to a course mind-set when faced with designing a solution to any performance problem. It’s an understandable response. That’s what most have done throughout their careers – design and deliver courses. Also, courses are relatively straightforward projects to undertake. Standard instructional design methodologies can be applied. They consist of a one-off event or a series of events that can be relatively easily scheduled and delivered. We know how long they’ll take, what resources they’ll use and we can manage the process quite easily. However, we also know that most learning doesn’t occur in courses or events. It occurs in the workplace, in bits-and-pieces. It occurs through watching an expert, or through a conversation we have with colleagues or a manager, or when we make a mistake and have the opportunity to reflect on how we’d do it next time, or in one of many other ways. Designing for learning in this environment is altogether different – and often a more ‘messy’ and complex matter. But outcomes are likely to be better. People are more likely to retain the learning they achieve through experience. And this type of ‘informal’ or workplace learning has been shown to be generally better received, more effective and less costly than its formal counterpart. So de-focusing on courses and re-focusing on supporting learning in the workplace through social learning approaches and performance support will be critical in the future. There is no doubt about that. In fact, there is a good basis of fact to argue that the real power of eLearning is social and contextual. Those Learning professionals that understand and respond to this fact will be able to demonstrate greater impact. Those that stick to the content-rich, experience-poor models of the 20th Century will surely be overtaken by events. There have been millions of words written and spoken about ‘informal’ and social learning over the past few years. In fact, if a Martian had just arrived on Earth and strayed into a meeting of Learning and Development professionals or into a learning conference, or even picked up a professional journal, he would logically assume that these were the only ways humans learned. The Martian’s assumption would be roughly correct. Humans learn principally through the process of carrying out actions, making mistakes, getting help from others, having discussions about which approach to take, stepping back and reflecting on why ‘it isn’t working’ and using a myriad of other strategies in the heat of the workflow or activity. The shift in focus to workplace and social learning by HR and Learning professionals over the past few years is an significant one. And it’s not just a passing phase or fad. It is reflecting a fundamental change that is happening all around us – the move from a ‘push’ world to a ‘pull’ world, and the move from structure and known processes to a world that is much more fluid and where speed to performance and quality of results are paramount. The increased focus on social and workplace learning is causing considerable disruption in the L&D world both to the traditional roles for those who are designers and delivers of courses and programmes and also to the whole ecosystem of training and learning suppliers that inhabit the L&D world providing programmes, courses and content and the supporting infrastructure to deliver (mainly) learning and development events. In a way, what we’re witnessing is a significant shift in thinking about the best ways people can keep abreast their jobs and improve performance in a world where change is not only becoming the norm, but is accelerating on an almost daily basis. Other factors such as the changes brought about with new generations entering the workforce and technology changes creating participatory learning opportunities (as pointed out recently by Claire Schooley of Forrester Research) play their part. A number of approaches are emerging to meet this changing thinking. Our awareness that more learning occurs outside courses and curricula than inside has added fuel to the fire of social learning – which was lit by the plethora of emerging social media tools and technologies speeded on their way by events typified in the O’Reilly Media conference in 2004. Also, there has been a re-awakening of the understanding that context is vital for learning and, aligned with this, that performance in a formal training environment is not necessarily a good indicator of performance in a different environment, such as the workplace. To an extent context is replacing content as the key factor in organisational learning. These realisations are leading to greater focus on workplace learning – learning in the context of work. Learning and work are merging. Bubbling along under the ‘social’ explosion has been an increasing awareness that experiences are critical to learning and performance. The majority of learning is obtained through the experiences to which we are exposed. Many of our experiences are social, some are not. Whichever way we gain our experience, we now know that they are vital building-blocks for our development. Learning how to ‘do’ something is far more important than learning ‘about’ something in terms of improving performance. We didn’t learn to ride a bicycle by learning Newton’s first law of motion, nor did we learn how to best utilise our professional skills through reading or being told about them. We learned through doing them or, at least, attempting to do them. The theory and explanations are often useful, but the real learning occurs through experience and practice. 70:20:10 is a reference model or framework. It’s not a recipe. It’s based on empirical research and surveys and also on a wide sample of experiences that suggest adult learning principally occurs in the context of work and in collaboration with others (as the great educational psychologist Jerome Bruner once said ‘our world is others’). 70:20:10 is being used by many organisations to re-focus their efforts and resources to where most real learning actually happens – through experiences, practice, conversations and reflection in the context of the workplace, not in classrooms. 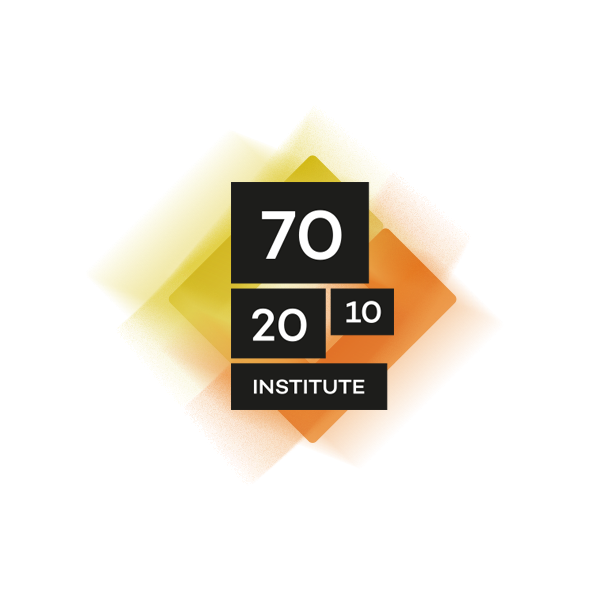 They have found the 70:20:10 framework a useful strategic tool to help them transform the way their organisations allocate resources and approach employee development – whether it’s leadership, management or individual contributor development. Anyone trying to 'prove' that the percentages fall in exact ratios, or anyone searching for peer-reviewed papers demonstrating the same is not only wasting their time, but clearly doesn't 'get it'. The fact that most development occurs outside formal learning has been known for many years, but the idea of specific ratios of the formal to informal split has only been in focus for the past 40 years or so. Eichinger & Lombardo published some details in their book The CAREER ARCHITECT Development Planner (now in its 5th edition). More recently (2010) a survey by Peter Casebow and Owen Ferguson at GoodPractice in Edinburgh, Scotland, found a similar split in their Survey of 206 leaders and managers. Casebow and Ferguson found that informal chats with colleagues were the most frequent development activity used by managers (and one of the two activities seen as being most effective – the other one being on-the-job instruction from a manager or colleague). 82% of those surveyed said that they would consult a colleague at least once a month, and 83% rated this as as very or fairly effective as a means of helping them perform in their role when faced with an unfamiliar challenge. The other top most-frequently used manager development activities included search, trial-and-error and other professional resources. Clearly, conversations (through informal chats with colleagues) and learning from the experience of others (through workplace instruction from their manager or a colleague - receiving the benefit of their experience and providing the opportunity for guided practice) are important in development of the surveyed group. My colleague Jay Cross has listed other research into formal and informal learning (‘Where did the 80% come from?’) and explains why definitive figures have little meaning in the larger context. Jay identified a rough 80:20 split between informal and formal learning which he discussed at length in his Informal Learning book. For me, at its heart 70:20:10 is all about re-thinking and re-aligning learning and development focus and effort. It involves stepping outside the classes/courses/curriculum mind-set and letting outputs drive the cart – thinking about performance improvement and helping people do their jobs better rather than spending the majority of time and effort on inputs – learning content, instructional design etc. Of course the inputs are important at times, but we need to keep our perspective. Content and design are not the most important inputs to the learning and capability development process. It doesn’t matter if the job is simple or complex, whether it’s repetitive or highly varied, or if it’s driven by defined processes or requires extensive innovative and creative thinking. The principles are the same – the most effective and generally fastest way to improve and gain mastery will be through workplace and social learning. In practical terms what does this look like? The above are just a few options available for development in the ‘70’ and ‘20’ zones. When Learning professionals look at these lists they often remark that many of these activities are not in their bailiwick. Of course this is correct. The responsibility for creating an environment where real learning occurs and opening up workplace learning opportunities is primarily in the hands of senior leadership and line managers. However, HR and Learning professionals have an important role to play. A 70:20:10 approach does mean Learning professionals need to put a new lens on their responsibilities. L&D has an absolute responsibility as enablers – to ensure leaders and managers understand their people development responsibilities AND have the capability and tools to deliver. This means there’s a role for Learning professionals in both the analysis of performance problems and in the design of the solutions where the outcome is intended to be improved performance through better understanding (knowledge) and skills. All of this raises the question ‘does adopting the 70:20:10 framework change the role of the Learning function?’. There is only one answer to this question. Yes - it changes the role fundamentally. And the change not only impacts L&D professionals but HR professionals as well. These changes require new roles, new skills and new mind-sets. Learning professionals who have spent their time designing, developing and delivering formal, structured courses, programmes and curricula will need to adapt and develop their own capabilities. My experience has been that many find the challenges of working within the new framework both challenging and rewarding. The 70:20:10 model certainly places Learning professionals much closer to their key stakeholders and to the white heat of their organisation’s Raison d'être. It has the potential to move L&D from a support function to the position of being a strategic business tool. Nike, Sun Microsystems, Dell, Goldman Sachs, Mars, Maersk, Nokia, PriceWaterhouseCoopers, Ernst & Young, L’Oréal, Adecco, Banner Health, Bank of America, National Australia Bank, Boston Scientific, American Express, Wrigley, Diageo, BAE Systems, ANZ Bank, Irish Life, HP, Freehills, Caterpillar, Barwon Water, CGU, Coles, Sony Ericsson, Standard Chartered, British Telecom, Westfield, Wal-Mart, Parsons Brinkerhoff, Coca-Cola and many others. If you want an overview of the 70:20:10 framework with some examples, I have uploaded a SlideShare presentation HERE. I would like to acknowledge my colleagues in the Internet Time Alliance and others who have contributed to some of the material in this post.